Learn 3 great ways to enjoy Russians' favorite dairy food! Tvorog balls, creamy zapekanka and granny's exceptional pie – three recipes with the Russian version of cottage cheese that you’ve probably never heard of, but which you are bound to fall in love with. All of my favorite pastries contain tvorog, either in the dough or filling. Probably all Russians love tvorog, which was common even in Ancient Rus’ when people made it from sour milk in massive stoves. Until the 19th century, there was no clear distinction between tvorog and “cheese” because all dishes with tvorog were considered to contain cheese. In the mid 19th century, however, when cheese production started to become highly developed, tvorog finally became classified as a separate food product. Today, there are hundreds of recipes with tvorog, traditional as well as modern. I’d like to offer you three original and simple variations using tvorog in pastries. This is a quick and easy way to treat your family and friends to a lovely dessert. 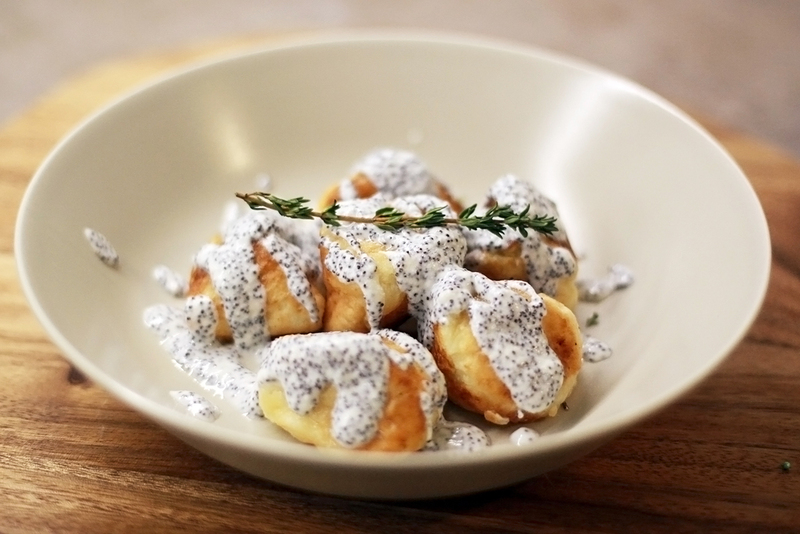 These creamy balls with rich poppy dressing will put a smile on anyone's face. 1. Mix all the ingredients for the balls in a large bowl and blend properly. 2. Divide your pastry into 12-15 balls and fry in hot oil. 3. To make the sauce, first pour poppy seeds into hot water and let stand for 15 minutes. 4. Then strain the water, and place the poppy seeds, sour cream and icing sugar in a pot and cook until it boils. 5. Sauce the tvorog balls and serve warm. For a richer taste, you can bake prepared balls with the sauce in the oven for 7-10 minutes. This is one of the easiest and most delicious breakfasts that provides you with energy and a good mood for the rest of the day. 1. Divide the sour cream into two equal portions. Put semolina into one portion of sour cream and let it rise for about 15 minutes. 2. Then mix tvorog, eggs, sugar, vanilla, salt and sour cream with semolina in a bowl and give it a good stir. 3. Butter your baking pans and sprinkle lightly with semolina. Put the dough into the pans and cover the tops with the remainder of sour cream. Bake for about 30-40 minutes (180°C), let cool, and serve with condensed milk, sour cream or berries. My granny came up with this pastry recipe when my father was a small boy, and today it's also loved by my family's youngest generation. 1. Stir the tvorog, smooth butter, sugar and salt. Add eggs and mix. 2. Then sift plain flour with baking powder and make the pastry. It should be thick but also silky to the touch. Leave the pastry in the fridge for about 30 minutes and prepare your filling. 3. Cut your favorite fruits and berries (I use apples with cranberry), and powder with icing sugar. 4. Next, form your pie in a baking pan, fill with stuffing and bake for about 30-40 minutes (190°C). Cool your pie and serve with icing sugar and vanilla ice cream.